Dealing with any ethical issue can be challenging. When it involves children or adolescents it can be especially confusing, daunting and anxiety-provoking. Mental health professionals can be left with more questions than answers and without a clear method for navigating these waters. In this skill-building recording, Dr. Terry Casey will equip you to handle whatever ethical challenge might arise involving children, adolescents, and their families. 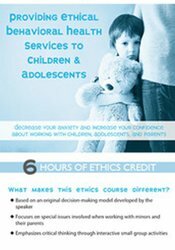 You will learn how to employ a unique ethical decision making model developed by Dr. Casey when dealing with a variety of scenarios, including mandatory reporting, boundaries, divorce and child custody, and virtual relationships. Using case vignettes, Dr. Casey will guide you through case studies as you evaluate decisions through the lens of applicable ethical codes as well as federal and state laws. This self-study course includes 5.5 hours of general ethics instruction. Not all boards allow ethics credit for self-study products. If ethics is not specified within your licensing board’s approval statement below, please contact your board to determine the applicability and amount of ethics allowed. This self-study course has been approved by PESI, Inc., as a NAADAC Approved Education Provider, for 5.5 CE in the Legal, Ethical, and Professional Development skill group. NAADAC Provider #77553. PESI, Inc. is responsible for all aspects of their programming. Full attendance is required; no partial credit will be awarded for partial attendance. California Alcoholism & Drug Abuse Counselors: PESI, Inc. is an approved provider by the CCAPP-EI, Provider #: OS-03-036-1019. This self-study activity meets the qualifications for 5.5 CEH's (continuing education hours). Connecticut Addiction Counselors: Provider #120924. This course has been approved as a CCB approved training and has been awarded 5.5 hours by the Connecticut Certification Board. New York Counselors: PESI, Inc. is recognized by the New York State Education Department's (NYSED) State Board for Mental Health Practitioners as an approved provider of continuing education for Licensed Mental Health Counselors. #MHC-0033. This self-study activity will qualify for 6.5 contact hours. Full attendance is required; no partial credits will be offered for partial attendance. South Carolina Counselors, Marriage & Family Therapists and Psycho-Educational Specialists: This program has been approved for 5.5 continuing education hours by the South Carolina Board of Examiners for Licensure of Professional Counselors, Marriage and Family Therapists, and Psycho-Educational Specialists. Provider #4540. Texas Counselors: PESI, Inc. has been approved as a continuing education sponsor through the Texas State Board of Examiners of Professional Counselors. Provider #: 2477. This self-study course qualifies for 5.5 continuing education credits. This course consists of 5.5 self-study clock hours. Credit requirements and approvals vary per state board regulations. Please save the course outline, the certificate of completion you receive from this self-study activity and contact your state board or organization to determine specific filing requirements. New York Educators: PESI, Inc. is an approved sponsor of CTLE with the New York State Education Department's (NYSED) Office of Teaching Initiatives. Provider #23567. This self-study activity will qualify for 5.5 Approved Continuing Teacher and Leader Education (CTLE) Hour(s), in the area of Pedagogy. Hours are based on full attendance. Board required certificates will be sent after the program. This self-study activity consists of 5.5 clock hours of continuing education instruction. Credit requirements and approvals vary per state board regulations. Please save the course outline, the certificate of completion you receive from this self-study activity and contact your state board or organization to determine specific filing requirements. New York Marriage & Family Therapists: PESI, Inc. is recognized by the New York State Education Department's (NYSED) State Board for Mental Health Practitioners as an approved provider of continuing education for Licensed Marriage and Family Therapists. #MFT-0024. This self-study activity will qualify for 6.5 contact hours. Full attendance is required; no partial credits will be offered for partial attendance. Iowa Nurses: PESI, Inc. is an approved provider by the Iowa Board of Nursing. Provider #: 346. Nurses successfully completing these self-study materials will earn 5.5 self-study contact hours. This self-study activity consists of 5.5 clock hours of continuing education instruction. Credit requirements and approvals vary per state board regulations. Please save the course outline and the certificate of completion you receive from this self-study activity. Contact us for more information on your state board or organization specific filing requirements. American Psychological Association credits are not available. Canadian Psychologists: PESI, Inc. is approved by the Canadian Psychological Association to offer continuing education for psychologists. PESI, Inc. maintains responsibility for the program. This program is approved for 5.5 self-study continuing education hours. Florida Board of Psychology: PESI, Inc., is an approved provider with the Florida Board of Psychology. Provider Number 50-399. This product qualifies for 5.5 self-study continuing education credits. Please make sure to bring your license number to the seminar so that we can report your attendance to CE Brokers. Colorado Social Workers: PESI, Inc. is an approved provider with the Colorado Chapter of the National Association of Social Workers. Provider #1413. This course has been approved for 5.5 continuing education hours. Florida Social Workers/Marriage & Family Therapists/Mental Health Counselors: PESI, Inc. is an approved provider with the Florida Board of Clinical Social Work, Marriage and Family Therapy and Mental Health Counseling. Provider Number 50-399. This self-study course qualifies for 5.5 continuing education credits. Kansas Social Workers: PESI, Inc. is an approved provider with the Kansas Behavioral Sciences Regulatory Board. Provider #14-006. This self-study course has been approved for 5.5 continuing education hours. New York Social Workers: PESI, Inc. is recognized by the New York State Education Department's (NYSED) State Board for Social Work as an approved provider of continuing education for licensed social workers #SW-0008. This self-study activity will qualify for 6.5 contact hours. Full attendance is required; no partial credits will be offered for partial attendance. Expires: December 31, 2020. Ohio Social Workers/Counselors/Marriage & Family Therapists: PESI, Inc. is an approved provider with the State of Ohio Counselor, Social Worker and Marriage & Family Therapist Board. Provider approval #: RCST071001. Successful completion of this self-study course meets the qualifications for 5.5 clock hours of continuing education credit. This self-study activity qualifies for 5.5 clock hours of instructional content as required by many national, state and local licensing boards and professional organizations. Retain your certificate of completion and contact your board or organization for specific filing requirements.